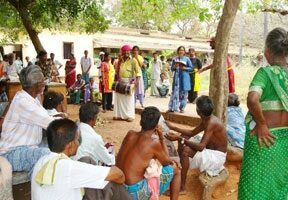 (2007-2009) Funded by the Gere Foundation India Trust – Nalamdana holds monthly role plays and full length drama’s at the largest Government hospital for TB and HIV, The Government Hospital for Thoracic Medicine (TAMBARAM). Over 1000 patients per day receive free treatment and benefit from our entertaining programs: learning crucial messages on compliance, side effects and simple Do’s and Don’ts conveyed through theatre and mime. Nalamdana has also started the novel idea of a Daily CABLE RADIO Program “Thendral” (meaning “breeze” in Tamil), which links over 12 wards and reaches over 250 patients per day with music and information. This radio program, run with the help of participating doctors, counselors and nursing staff, ensures that accurate information is delivered in an ideal mix with Nalamdana’s excellent entertainment education skills. This is a pioneering communication project that helps patients feel better as they get better! Donations are welcome to expand and to reach more wards. A detailed external evaluation Report is available with MA/SA Country Director and Nalamdana.